​​​What does Heat Genie do for you? Simplifies the most difficult of Solid Fuel installations. Create gravity circuit where previously impossible such as bungalow installations or where the Stove is a long distance away from the Cylinder. No need to purchase expensive new cylinder or thermal store to link-up solid fuel source. No need for expensive cylinder coil or heat leak radiator on the gravity circuit. 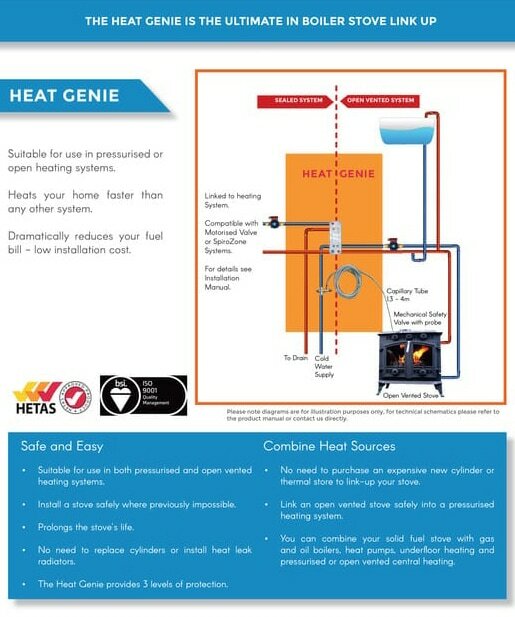 The Heat Genie provides the safety elements with 3 levels of safety. 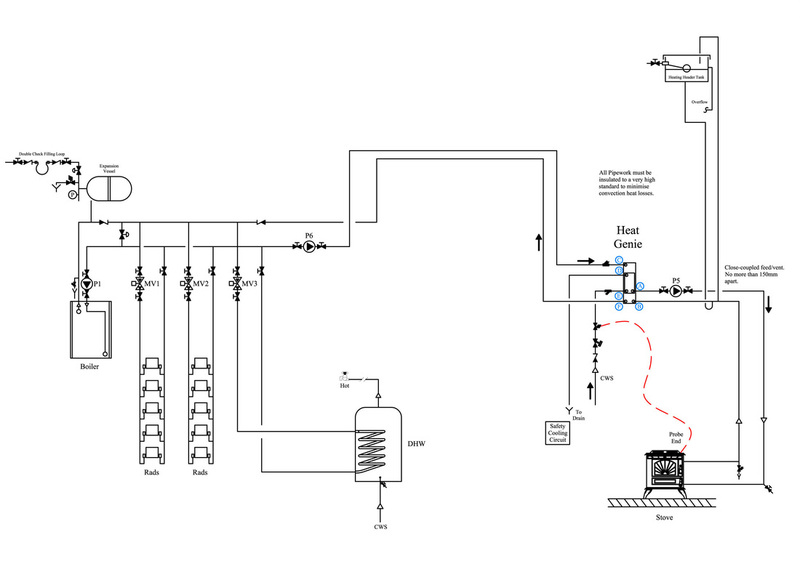 Option for extremely rapid heating of your existing domestic hot water. Simple to install, fully labelled ports. 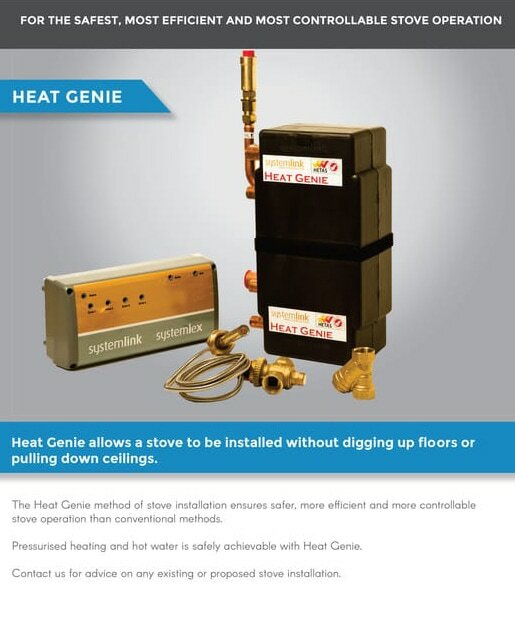 How does a Heat Genie Work? 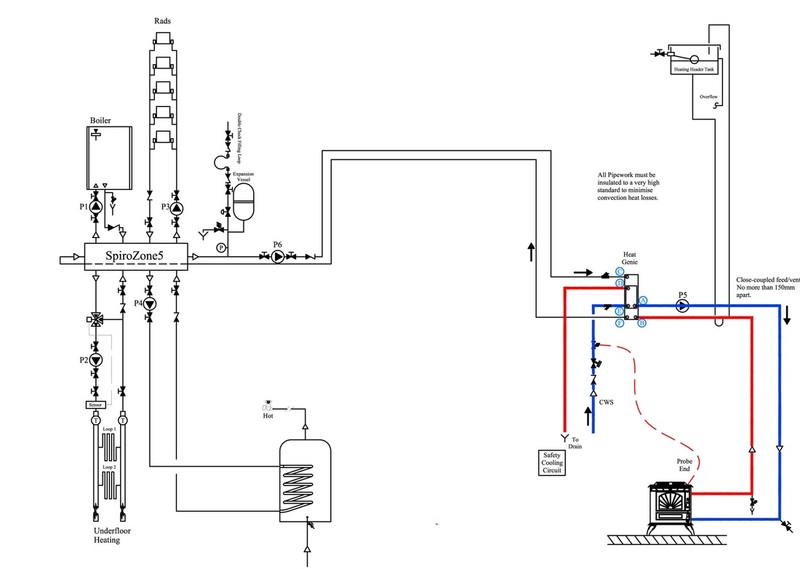 Standard Heat Genie Schematic showing a Zoning & Link-up SpiroZone manifold on the left with a gas boiler and a stove as the heat sources. 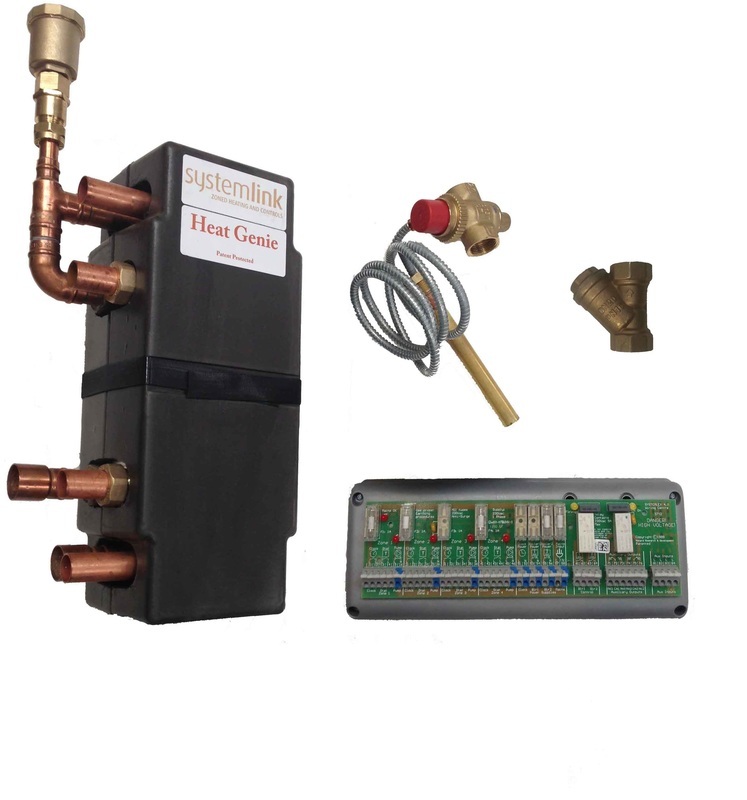 The Heat Genie is used as the method of heat transfer from the stove to the manifold. ​There are also 1 domestic hot water zone and 2 radiator heating zones (e.g 1st floor bedrooms & ground floor living area) attached to the manifold which allows heat from either heat source to be distributed to any of the heating zones. 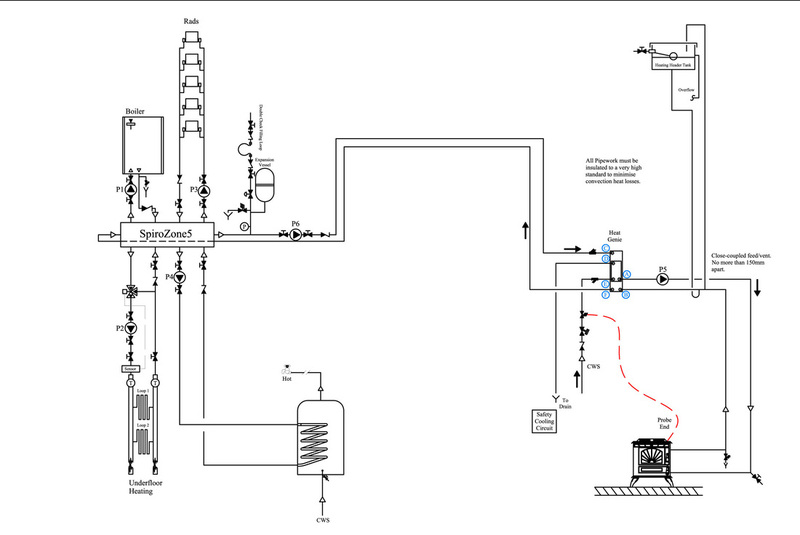 This diagram shows how the solid fuel boiler is used to heat any of your heating zones through the Heat Genie. The Plate Heat Exchanger technology allows for the easy integration of a solid fuel boiler into a sealed heating system. This stage of safety is based on a special thermal valve that operates without electricity in a purely mechanical way. The valve has a probe at the end of a capillary tube that detects 95C water temperature and via the capillary tube opens the valve. This allows us to take in cold water through the Heat Genie effetively sucking the heat out of the solid fuel thermosyphon loop and in turn raising the temperature of the incoming cold water and then delivers it out safely to the drain. This is a very rare event and will only happen in cases of electrical power failure, at all other times the electricity is on and allows the pumps in the system to dissipate the heat. 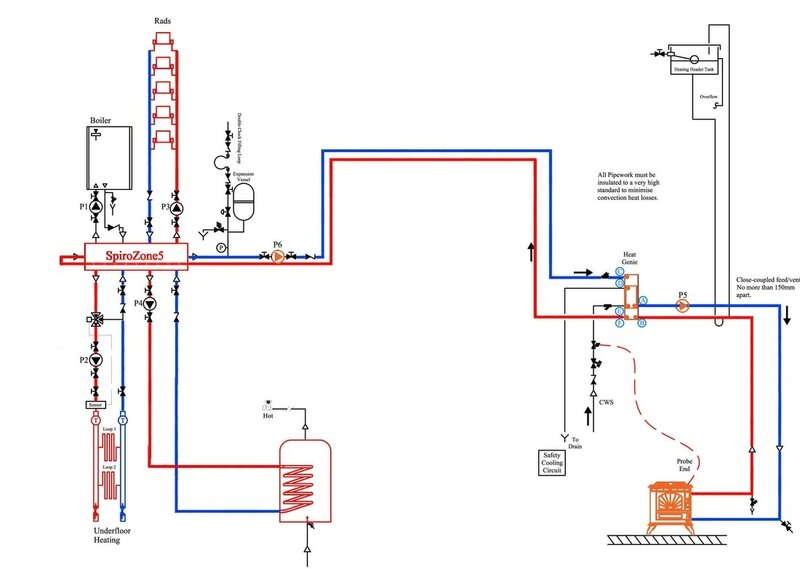 This diagram shows how the Gas or Oil boiler being used to heat any of your heating zones through as standard through one of zoning and link-up manifolds. Using motorised zone valves to subzone the heating system. 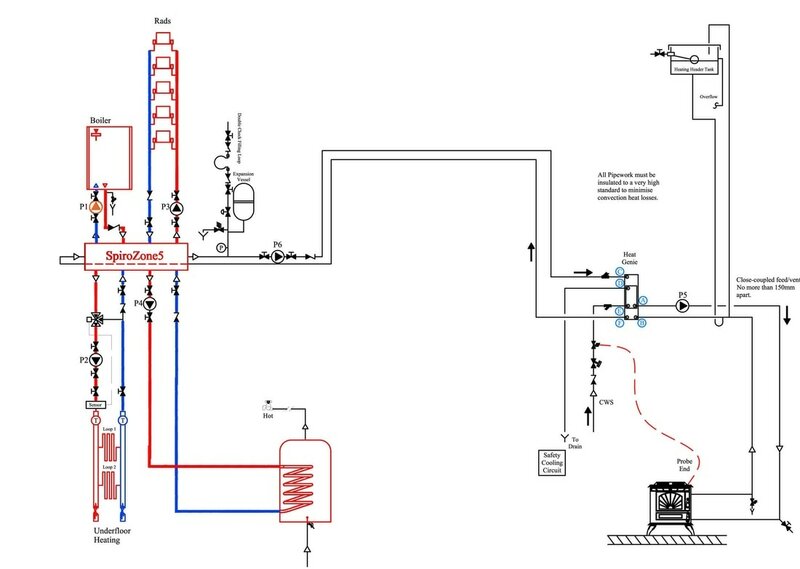 Systemlink would consider this method of zoning an inferior method of zoning due to the unreliable nature of zone valves but due to the large number of zone valve installations we include the scenario for completeness.